William B. Williams and his wife, Jane Owen, were my great grandparents. I never met William or Jane, but my mother adored them. They came from Wales in the 1880s and settled in Utica, New York, along with many other Welsh people. I recently acquired from my brother the trunk that William had used during his travel to and from Wales. The trunk was manufactured by Henry Likly & Co., Rochester, New York. After doing a little research, I learned that the company name “Henry Likely & Co.” was used from the late 1870s until 1925. (1) Thus, it is possible that William and Jane bought this trunk soon after their arrival in New York in the 1880s. Fortunately for them, they rode the Lusitania before it was torpedoed and sunk in 1915. (http://en.wikipedia.org/wiki/RMS_Lusitania). They travelled on this ocean liner just one year after its launch in 1907. 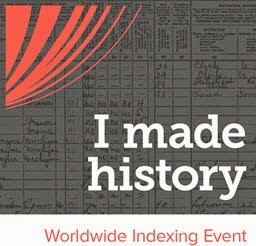 I then went to the Ellis Island website (http://www.ellisisland.org) and searched for arrivals on the Lusitania in 1908. I found an arrival on July 10, 1908 from Liverpool, England, and, sure enough, William and Jane Williams were on board. They were listed as married U.S. citizens with their last place of residence as Utica, New York. (2 and 3) According to the Ellis Island website, William was age 53 (2) and Jane was 4… (3) I am not sure why Jane’s exact age was not completed. 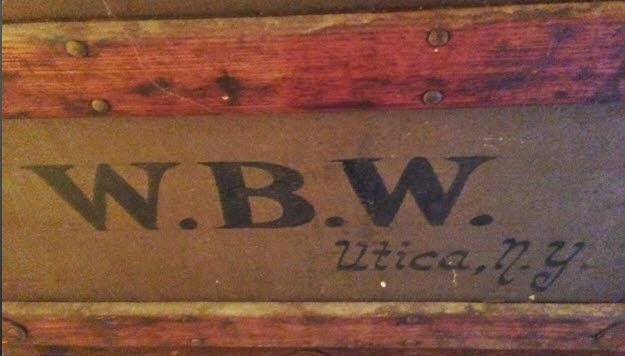 Since my great grandparents had lived in Utica for over twenty years in 1908, they apparently went back to Wales to visit. Liverpool is not far from Holyhead, Wales, where they were born. (A MapQuest search shows that the two cities are approximately two hours apart.) I wonder if there was a family event or if they just wanted to see the old country again. They had lost a son, Robert, to illness in 1906. Another son, William, was killed by a train in 1907. I wonder if this was their first trip back to Wales after they arrived in this country in 1883. Who, if anyone, greeted them when they arrived in Wales? Who was watching their three daughters in Utica (Jane, Winifred and Isabel), who weren’t quite old enough to stay alone? Perhaps William’s mother, also named Jane, who was living in Utica at the time, kept an eye on the girls. Or perhaps one of William’s siblings who also lived in Utica. There was another couple on the ship named Robert and Elizabeth Jones, who were also from Utica. (4 and 5) Did my great grandparents know them? 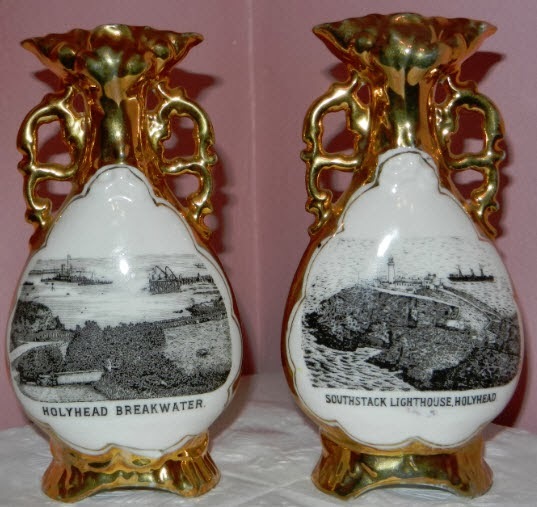 I have two "Holyhead, Wales" vases that have been in my family for years. I wonder if Jane and William bought these as souvenirs from their trip? There is no discernible manufacturer name on the vases, and I have not been able to find similar vases on the Internet that might give me an approximate date of their manufacture. (1) Aderman, Margaret, "Made in Rochester: Researching Local Businesses," Monroe County Library System, Rochester, New York, 2016 (http://www3.libraryweb.org/lh.aspx?id=945 : accessed 18 Jun 2016). 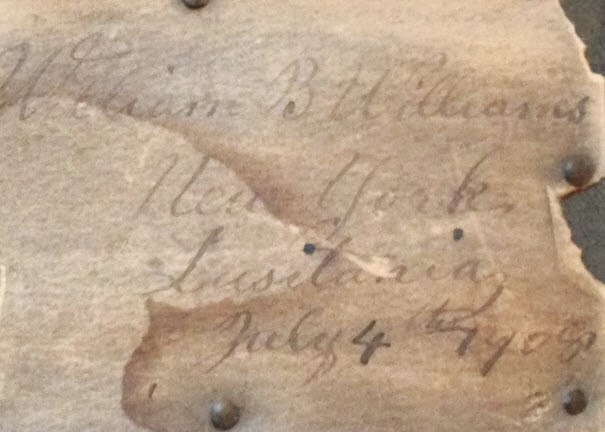 (2) “Passenger Record” database, Statute of Liberty-Ellis Island Foundation, (http://www.ellisislandrecords.org), accessed 25 Oct 2013, entry for William B. Williams, 53, arrived 10 July 1908 on the Lusitania. (3) “Passenger Record” database, Statute of Liberty-Ellis Island Foundation, (http://www.ellisislandrecords.org), accessed 25 Oct 2013, entry for Jane Williams, 4…, arrived 10 July 1908 on the Lusitania. (4) “Passenger Record” database, Statute of Liberty-Ellis Island Foundation, (http://www.ellisislandrecords.org), accessed 25 Oct 2013, entry for Elizabeth Jones, 46, arrived 10 July 1908 on the Lusitania. (5) “Passenger Record” database, Statute of Liberty-Ellis Island Foundation, (http://www.ellisislandrecords.org), accessed 25 Oct 2013, entry for Robert W. Jones, 42, arrived 10 July 1908 on the Lusitania. 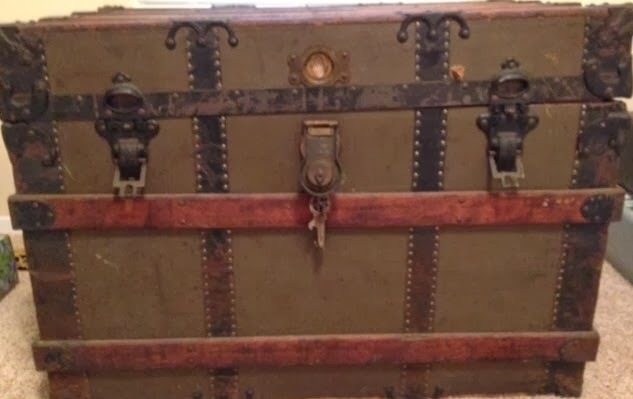 Great job connecting this beautiful trunk to your great grandparents' travels. How lucky for you that your brother passed it to you. :) Good luck answering your new questions. Love your blog! Thanks, Jennifer. I enjoy your blog also. It has been on my blog list since I started my blog over a year ago.